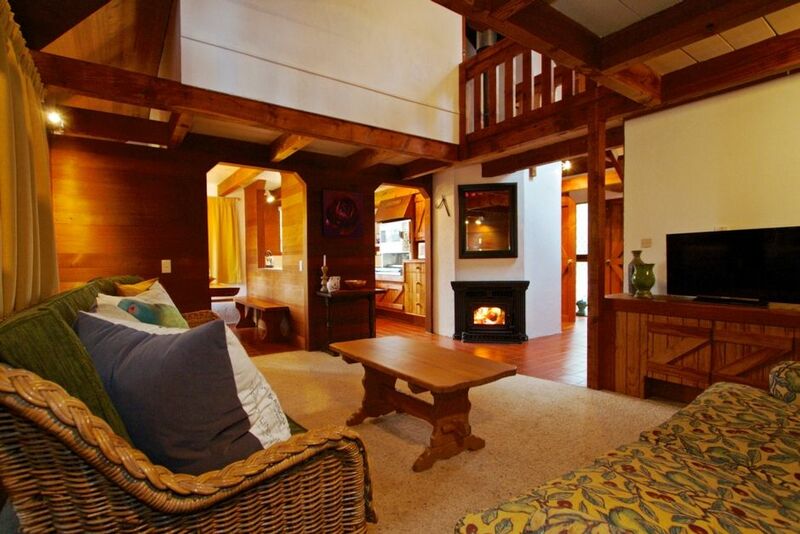 A Swiss cedar chalet located in the heart of the vibrant ski town of Ohakune. Timeless craftsmanship makes this cedar cottage a very special base from which to explore Mt Ruapehu and its surrounds. Built by a Swiss carpenter, this chalet is packed full of gorgeous features which make the property truly unique. A full renovation has ensured that it is immaculately presented and your comfort maximised. Watch the sun set across the mountain from the cozy dinning room while enjoying a home cooked meal from the fully equipped kitchen. After a day of skiing return to the warmth of the log fire and enjoy endless hot water from the infinity hot water system. Extra heaters are provided in the bedrooms. For apres ski, it's just a short stroll to a selection of Ohakune's best bars and restaurants. You can rest assured the next morning your ski gear will be dry in the spacious drying room complete with ski racks and boot dryers. Guests are provided with complimentary WIFI access. The mezzanine floor overlooking the lounge provides a cozy space to relax or a fun place for the kids to play. The two cedar lined bedrooms sleep four guests. Extra guests have a choice of a queen fold out bed or two comfy single squab beds made up in the mezzanine space. All beds are made up on your arrival and freshly laundered towels are provided. Located at the end of a quiet cul-de-sac street, the Mangawhero river walkway is just outside the door for a morning stroll or walking the dog and the towns' playground is just around the corner. The Ohakune township is the closest residential area to Turoa ski field and Whakapapa ski field is only a 45 minute drive away. As well as skiing, the chalet is also a great base from which to explore the regions' cycleways (including the "Old Coach Road") with bicycle hire just down the road. The Tongariro crossing is also readily accessible from Ohakune with shuttles leaving daily in peak season. Pet Friendly - please advise when bringing pets. Steve and myself are Ruapheu locals, living on our farm which borders the Tongariro National Park. We are fortunate to have unobstructed views of Mount Ruapehu with Ohakune as our local town where we enjoy the cafes and restaurants the village has to offer. The great outdoors is our backyard with both summer and winter activities, cycling, skiing, hiking and rafting to name a few. We love to get out there both at home and abroad! We are excited to be able to offer guest the gorgeous Swiss Chalet property for their stay in Ohakune. One shower and vanity. Separate toilet. We loved our stay here! The house was sparkling clean and had everything we needed! Beautiful view from the dining room too (no photo will do it justice)! Would definitely return over and over again. Stayed here with a couple of friends as we explored Ohakune and it's surrounds. Great location, close to the shops, you could walk if you wanted to. Kitchen was great to be able to cook a few meals in. Was lovely to come home at the end of the day and warm up with the fire place. Would stay again! The perfect place to stay .. We loved being here. A truly lovely place to stay. A peaceful and gracious haven. Very clever use of space. It was compact but spacious at the same time. It was exceptionally clean and well presented. Wonderfully located so that we could walk to town and also up the river to the Junction area. We hope we can stay again. Thank you for sharing it. Everything we needed for a great, easy stay was there. Really well set up. Great communication, and Olivia went above and beyond, sending us back something we left behind. Thank you! We only stayed one night, but found this house to be comfortable and conveniently located for exploring the south side of Ruapehu. The kitchen was well stocked and the wifi worked well. The full-size beds were very comfortable, but the twin beds on the mezzanine were a bit basic. Warm and Cosy. Spotlessly clean accommodation. The chalet had a beautiful view from the dining room. Nice and handy to the shops by car or walking. The chalet is set on a section with a lot of trees which allowed for summer shade whilst outside. The interior of the chalet was warm and inviting. The kitchen had just about everything you need for a long or short stay. Handy to shops and restaurants also. Olivia was amazing, very quick replies to emails. Thank You Olivia for letting us stay at your amazing place in Ohakune.